Now you can know more about the Fall Line Artist Guild than ever! 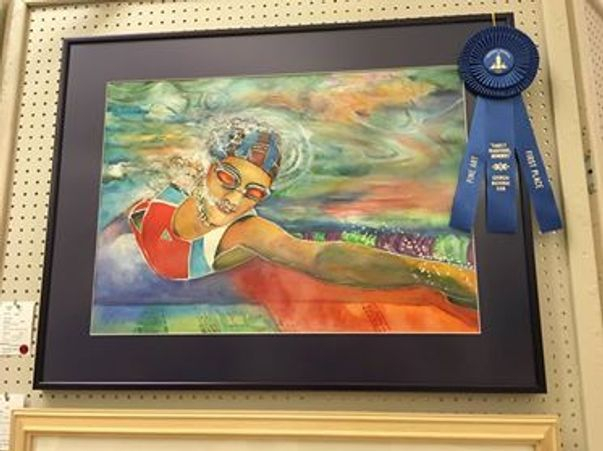 This year at the 2018 Georgia National Fair, FLAG Member Dana Wiggins Thompson brought home first place in the professional division with the beautiful watercolor shown above! Dana Wiggins Thompson specializes in both photography and watercolor. To see more of her work, feel free to visit www.thephotosmith.zenfolio.com. For the 2018 Kaolin Festival Season, the Fall Line Artist Guild has planned several Artee Parties for you and your friends to enjoy! On the day of the Kaolin Festival, the first Artee Party will occur at 1:00 p.m. in a wonderful, air-conditioned room in the old Sandersville School Building (SES). Even if you think that you can’t paint, you will surprise yourself! In just a short time, you will have a beautiful, finished product that you will be proud of. There will be 3 different sessions, all beginning at 1:00 p.m. Seating is limited so if you would like to ensure a place, stop by the Chamber of Commerce and preregister. On the day of the festival spaces will be available on a first-come, first-serve basis. You will also want to save the following dates for the 3 other Artee Parties which are planned for the fall. October 20, Oct. 27, and Nov. 10 are being prepared just for you! Come, bring a relative or friend, and have a wonderful Saturday morning relaxing as you explore and create different types of art. The sessions are limited to 8 people each, so you will want to hurry and register before all seats are filled. You can register for the parties at either the Chamber of Commerce or Ideal Beauty Salon, which will be the location of the last 3 parties. FLAG would like to thank their 2018 Patrons and Sponsors who support the guild and their endeavor to enhance the community through an awareness of the arts: George D. Warthen Bank, Imerys, Burgess, Chapman, Moye’s Insurance, Thiele, Citizens Bank, Washington County School System, Spartan Contracting, Jet, Sandersville Drug, Washington County Development Authority, and Washington County Chamber of Commerce. It’s Fall and football is here! 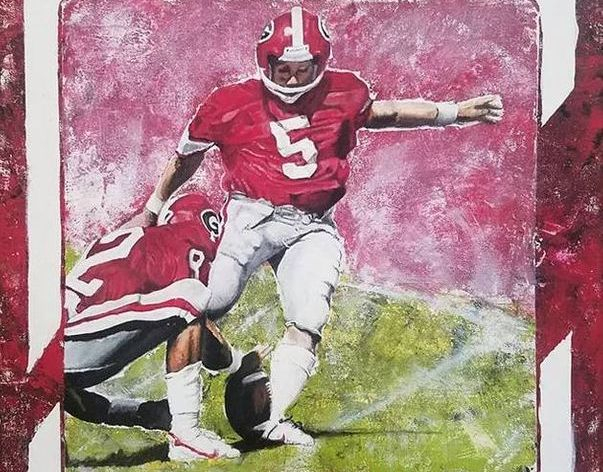 That’s right, not only do you find football at Brentwood and WACO on Friday nights but it’s right here in the Fall Line Artist Guild Gallery which is located at 603 South Harris Street in Sandersville, GA.
"Pack your Bags” and head on down to the FLAG Art Gallery. 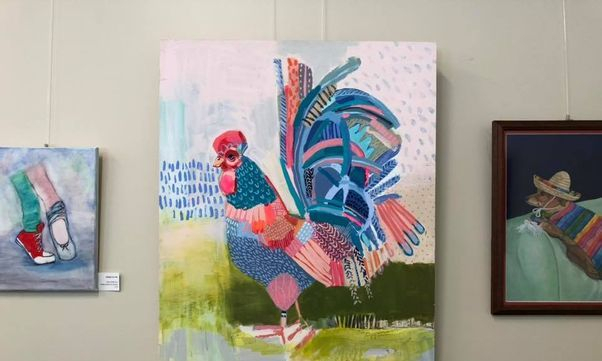 From now through November, you can browse the natural talents of local artists from 9 a.m. to 5 p.m., Monday through Friday. 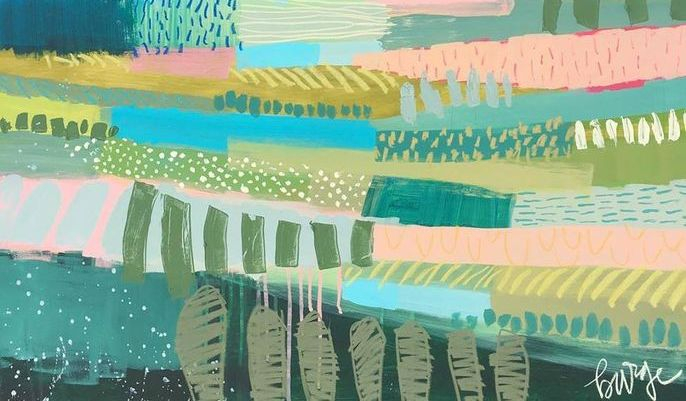 Whether you are wanting to travel out west to the Badlands, escape to the Rockies, or find the calming sands of the Atlantic, you will find works of art that will transport you there. Come, bring your friends and family, and enjoy a moment out of your hurried day to be swept away into the world of art. The FLAG Gallery Space in the Washington County Commissioners Office on the square in Sandersville currently features the talents of Tonia Marynell, Bill Phillips, Dana Wiggins Thompson, and Shaun Veal. These artists are celebrating and promoting the historic Sandersville School also known as Sandersville High/Elementary. The school built in 1939 and expanded several times over the course of sixty years is currently undergoing revitalization to become a center of cultural activities for Washington County and surrounding areas. Of course, the school has always been a center of culture not only for the bright young minds of the county, but the community at large as well. For many decades the school’s auditorium was the only such venue in Sandersville. It is the hope of the Sandersville School Building Authority that the school and grounds will continue to be a focal point of community activities. The current Sandersville School exhibit will remain in the Gallery Space until the first of October where it will be moved to the foyer of the school in time for the 2018 Kaolin Festival. The festival is held at Linton Park which includes the school grounds. The next Gallery Space exhibit will focus on the fall, winter, and holiday season. All FLAG members are encouraged to display any artwork pertaining to these themes. Since the artwork will span October through December, the holiday aspect should be a subtler focus. Notify Shaun Veal during the month of September at shaunveal@gmail.com that you will share your work! The FLAG Gallery Space is open during regular business hours of the Commissioner’s office.